UPDATE: Fixed the RSS feed icom. This is a port of Mike's excellent Skinplant 2005 theme. permission.txt included in zip file. That is a problem that was in the first zip file I upload...try re-downloading it again, and the timestamp on the sp2k5.jar file should be...1/17/2005 2:22pm...if it's 1:11pm, clear your browser cache, and download it again. Very, very nice WickedP ...my comp is now all Skinplanted. Woohoo! Wow, Very nice job! I as well others have been patiently wating for some FireFox themes. And to think it happened to match the WB skin I am using Looking forwaard to the Tutorial! 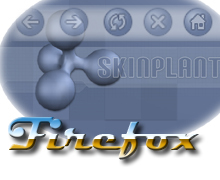 I so much wish more people were getting involved with Skinning FireFox Browser. Awesome work. I also love the animation. Bring on more! Can you snap a screenshot for me? I'd like to see what you're talk about so that I can fix it. the skin is my fave!!!!! Great skin! I've been using it for a couple of days now and it works great. Very professional looking too. Thanks for making this one.